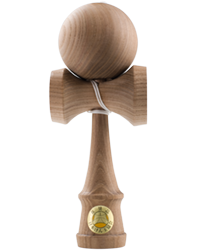 Ozora is new kendama brand manufactured by Yamagata Kobo studio. Ozora kendamas are as good for begginers as for advanced kendama players. They have different colour tints: Blue, green, red, light blue, pink and natural. The weight is 145g. They are sold with spare string. Japaneese kendama asosiacion label is yellow.